HEMPSTEAD, NY—A time-honored tradition ended in calamity tonight when, less than an hour after presidential candidates Mitt Romney and Barack Obama gathered together in the town of Hempstead, NY to debate their political views before villagers, a lantern tipped over and set fire to the ol’ Town Hall. According to sources, the fire broke out when a mare kicked over an old kerosene lamp, quickly lighting wooden pews aflame and igniting haystacks in the town’s historic gathering place, which for centuries has served as the center of social, spiritual, and political life for the people of Hempstead. Sources reported that by rallying together, villagers and a contingent of volunteer firemen were able to evacuate the building within 15 minutes, helping to save the lives of countless townsfolk, livestock, and political figures trapped within the smoke-filled rooms. 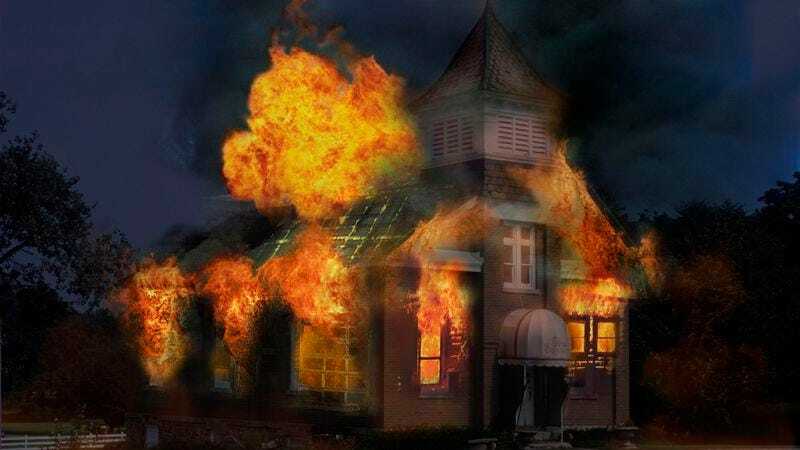 While congregants from the local Presbyterian Church helped keep hot cinders from setting fire to the schoolhouse down the street, a team of nursemaids worked to revive moderator Candy Crowley with smelling salts and a sip of brandy. The fire was an unfortunate end to an otherwise spirited week of great commotion and excitement in Hempstead, with townsfolk dressing in their Sunday best and local merchants making sure their storefronts and pantries were spotless for the presidential candidates’ arrival. Town sources reported even old Widow Chessum had roused herself to attend the debate, despite her severe gout. At press time, the citizens of Hempstead had scheduled an emergency meeting behind Whitaker’s Saloon to discuss a replacement venue for this year’s upcoming harvest ball.